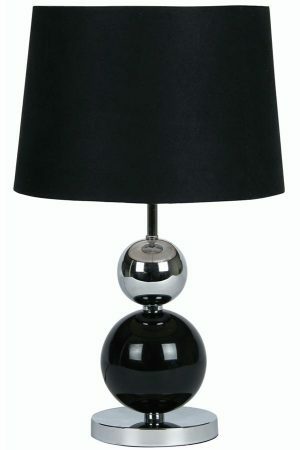 The Corby black and chrome ball touch table lamp is supplied with a black fabric lamp shade and perfect as an occasional or bedside table lamp. A stacked ball table lamp finished in chrome and black, with flat polished chrome base and and stem decorated with a large black sphere and smaller chrome ball on top. A complementing hard lined black shade sets this table lamp off nicely. Fitted with a three-stage touch dimmer, once for on, again to dim and touch for off. Also available in burgundy and champagne with complementing shades, please see below. Simple to use with their touch sensitive action and stylish to look at, our full range of touch operated lights are a versatile addition to your home lighting.